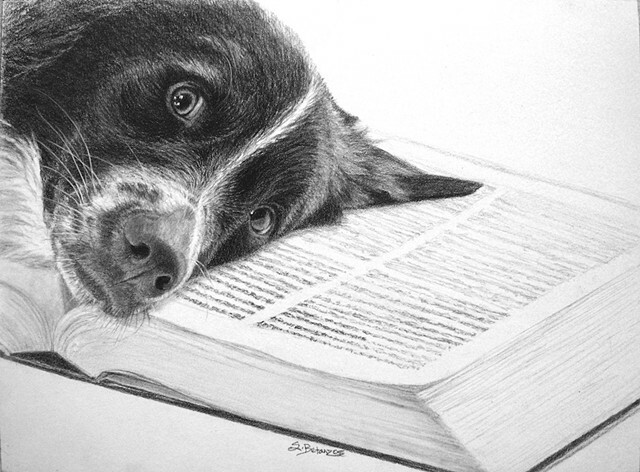 Pencil Drawing of Australian Shepherd Linus. One of my favorite drawings because I love books and reading! Perfect for your literary materials, book clubs and Read To A Dog sessions. (very popular with the kids at my library). Hand drawn on Strathmore 400 paper with Faber Castell 9000 pencils. * Your computer screen may show this drawing darker. Free USPS Shipping in the USA. Tracking included. Packaged in a crystal clear sleeve in a sturdy mailer.